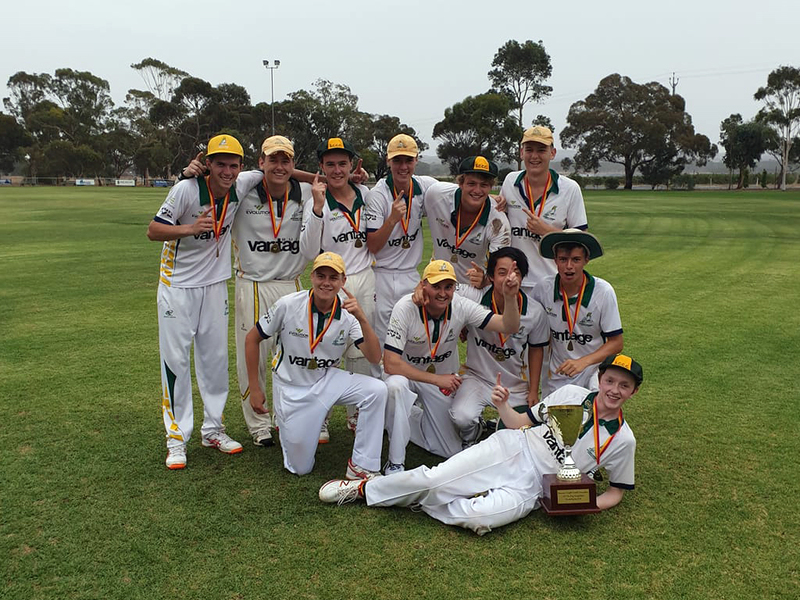 HomeClubC-Grade – A4 Premiers 2018/19! C-Grade – A4 Premiers 2018/19! In swiftly fading light and a light drizzle of rain, the C-Grade “rode the donkey” to a classy victory over South Gawler in the A4 Grand Final at Stockwell Oval yesterday. Building on the foundations laid by Kym McLean, coach Stephen Hands has much to be proud of in his first season as coach of the Cockatoos, taking all three senior sides to finals and bringing home the Cockies’ first senior 2 day premiership since 2011/12. As skipper Damien Hill pointed out in his gracious and effervescent acceptance speech, after him as “the old fart of the team”, the next oldest player in the C’s was just 19 and four of the team played in the U16s premiership side, so the future at Sandy Creek looks very bright indeed! After Damo won the toss and decided to bat, openers Brayden Fisher and Jae Hassold got Sandy off to a solid and steady start via a 47 run opening partnership. Jae was the first to go, bowled for 20. This brought the man with the Midas touch, Daniel “DK” Koch to the crease. Leading into the Grand Final, DK had scored 672 runs at 96 across both B’s and C’s (including 326 @ 163 since Christmas!) and he took up where he’d left off (before his flu made him a late withdrawal from the B-Grade Semi Final), striking boundaries at will and scoring at more than a run a ball. They had a 44 run partnership in quick time before Fisher was dismissed for 27 shortly after the drinks break. It was a classy knock from young “Fish Guts” and he complemented both Jae and DK nicely. Hopefully Brayden can build a bit of upper body strength during the off season to help him pierce the field more often and help him step up to the higher levels, because he has all the makings of a quality batsman. Next man in was Josh Riggs, who continued his late season form and he and DK combined well with a combination of quick singles and deft boundaries. The opposition didn’t look like getting either of them out until a “yes, no, sorry” debacle left DK short of his crease and run out with just over 6 overs to go. DK hit a composed 59 runs off just 54 balls, with 6 fours and 2 sixes. From there, it was a whirlwind of runs and wickets and the Cockies finished on 7/194, a total all the lads would have been happy with before the start of play. South Gawler weren’t going to lie down though and their chase started quite fluently. Wyatt “Wazza” Ryan was bowling at a decent clip, but strayed a bit too full at times and the Cats were quick to pounce on anything they could drive. Similarly, they waited on loose width from Damo Hill at the other end and punished anything that wasn’t spot on. After 10 overs South were 0/47 and looking in command of the chase, building momentum and middling pretty much everything. A double bowling change proved to be the masterstroke, with both Adrian “Tuggers” Pullman and Jasper “Kramer” Roberts bowling tightly and putting the pressure back on the South batsmen to maintain the run rate. Although it was ultimately Kramer with the key breakthroughs, Tuggers’ efforts with the ball were superb, with over after over of line and length upping the pressure. The match changing moment would have to have been Wyatt Ryan’s diving catch in the deep off Kramer’s bowling. The big Cowboy plucked the ball from the sky with his big mitts like it was his second or third steak sandwich from an after match fry up. At the halfway mark, South were 4/79 with 116 to get (at 5.8 runs per over) and “Kramer” Roberts had the best bowling figures of 3/18 off six, much to the delight of “Rooey” Roberts who was providing his grandson and the rest of the team a huge amount of vocal support from the sidelines. After the break, every time South looked like pushing the runs along, they seemed to lose a wicket and the chase was becoming more of a mountain than a Hill. With the clouds rolling in with the occasional light spattering of rain and the radar looking ominous, the South boys started slowing things down and taking their time, while the Sandy bowlers tried to speed things up, bowling off just a few paces and changing the field swiftly between overs. Cockies coach Handsy paced the boundary nervously like a caged tiger. Another bowling change brought young spinner Isaac Werner on and he tweaked up a storm, ripping through their tail just in time. The roar of the Sandy Creek crowd on the 10th wicket seemed to open up the heavens and bring the rain that had threatened all afternoon, as the players kicked off their well deserved celebrations for a job well done! Diener 173 including 21 sixes! Sandy Creek Netball – GDCA A-Grade Premiers! Sandy Creek CC would like to thank all our sponsors for their generosity.